Almost all employers in Massachusetts must carry workers' compensation insurance coverage. Your employer's workers' compensation insurance carrier will review your case and determine whether it will provide benefits or not. The carrier should be identified on a poster in a break room or other employee common area. If you are injured or made ill at your job, you should report the injury or illness to your employer as soon as you can. The employer is only required to report the injury or illness to the state if you are not able to work for five or more days. If the employer fails to report your claim in a timely fashion, you can file an employee claim, which is Form 110, with the carrier and the Department of Industrial Accidents (DIA). A Boston employee’s claim attorney can guide you through each phase of this process. The workers’ compensation lawyers at Pulgini & Norton have more than 40 years of combined experience in this area of the law. Filing Form 110 ensures your claim is properly made to your employer's insurance carrier. You must file your workers' compensation claim within four years of the disability date. You should also complete Form 110 if the insurer has denied your claim or if you are not getting the workers' compensation benefits to which you believe you are entitled. For example, if your employer has reported your claim to its carrier, but the insurance carrier has stopped making payments for reasons you think are unfair, you can file a Form 110. When an insurer is denying a claim, it sends the claimant a Form 104, which is the insurer's notification of denial. On this form are the reasons for the insurer's denial and a description of how to appeal. You will need to attach documentation to the employee claim form and send it to both the DIA and the insurer. The documentation should include medical bills and other evidence to establish your claim. The form is available on the DIA website, but in many cases, it is wise to retain an attorney to handle your appeal. The purpose of completing and submitting a Form 110 is to ask for a judicial proceeding before a judge in order to get workers' compensation benefits from the carrier, or from the Workers' Compensation Trust Fund if the employer illegally failed to carry workers' compensation insurance. After the form is submitted, you will receive a notice of conciliation at the DIA. This is the first step in appealing an insurer's denial of your claim, or its decision to issue fewer benefits than you believe you deserve. The conciliation is an informal meeting at which you, the insurer, and your respective attorneys can try to reach an informal agreement about your benefits. The workers' compensation system is complex, and navigating it can be challenging without a lawyer. 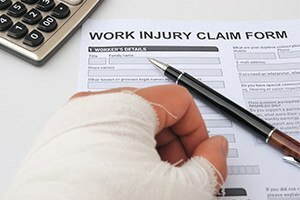 Before filing an employee's claim, or Form 110, you should consult an experienced workplace accident attorney who has advised other injured workers on the process. At Pulgini & Norton, our workers’ compensation lawyers can advise Boston employees on whether they may be eligible for benefits and represent them if it appears that they are. We also assist injured individuals in Cambridge, Malden, Andover, and other cities in Massachusetts. Call us at 781-843-2200 or contact us via our online form for a free consultation.